Note…this has been floating around out there for a bit on other blogs and on Pinterest and I’ve seen a few people try this out. I’m not sure who to credit for this amazing idea…so whoever you are…thanks! By the way…I subscribe to the idea that a good teacher is a great thief! Shout out to my son, Noah: He totally wanted to help out here and used some scrapbook rub ons to number these PLUS he wielded the hot glue gun to put the magnets on the back of the bottle caps. Thanks buddy! As for rewards…there are some really cute ideas out there and some sweet rewards cards that so many lovely folks have put together and I love love love them. 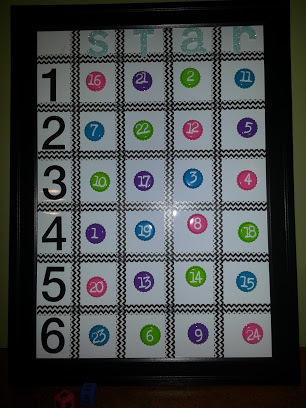 However, I’m the kind of gal that likes to ask my peeps what they’d like to earn…so I’ll put my reward system together after the start of the school year. 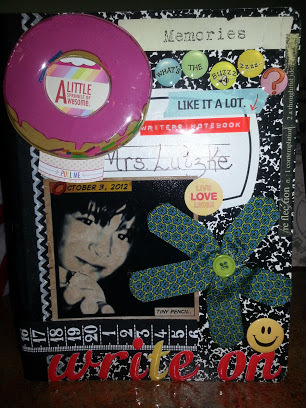 I hand the basic composition notebook out when they walk into our classroom and ask the students to personalize their notebook and bring it back to school with them on the first day. I can’t wait to see what my kiddos bring back with them! Instead of creating a list of words, I chose words that my third graders might encounter in their reading. I’d highly recommend personalizing your choices as well. 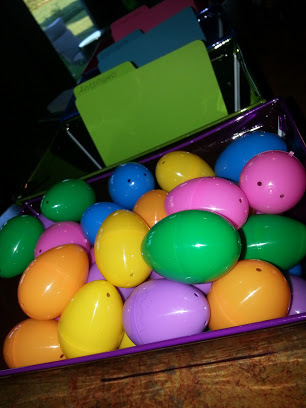 BTW…all eggs and baskets came from my favorite place: the Dollar Tree! I had a few mini file folders laying around, so I added those to the mix. I’ve been working on these a bit and BIG PUFFY HEART LOVE how they turned out! It’s a different take on “Making Big Words” which I adore. I just don’t like the time it takes to cut out all of those squares…even if the kids are doing it. Anywho…I made 5 boxes in each color so that the entire class can use these in small groups. 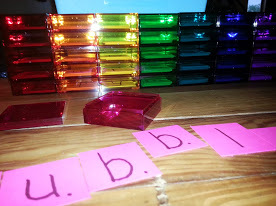 If you’ve never used Making Words or Making Big Words before, it’s really quite simple…letters are placed on individual cards so that students can manipulate words and explore “words within words” on their own or in small groups. There is really one giant word in each box, and the students try to figure out as many small words as they can while working to determine the big word. My kiddos have journals for this and they love it! I also put together the first 13 weeks worth of these boxes…I can’t wait to use them. The boxes came from a favorite place of mine: The Container Store. Each box meaures 2 x 2 x 3/4″ and costs 69 cents. I bought mine online, but if you are lucky enough to have a Container Store close by, they can be found in the gift wrap aisle. I picked up 12 x 12″ scrapbook paper in coordinating colors and just cut each square into a 1 1/2″ …if you do this, you’ll get 64 squares per sheet of paper and you won’t have to waste any by punching these out! I have lots of other things I’ve worked on and my phone cam isn’t cooperating, so I’ll just have to wait until next time to share the rest. Don’t forget to share the love with your colleagues…some of these were a little pricey and a little more time consuming, so if you don’t want to put these together for everyone, don’t sweat it. Do share when you can! You’ll be glad you did! Ok…I’ll admit it…I haven’t been inspired as of late. But this morning, I took a sneaky peek at all of the great posts out there and I must admit that I was quite inspired to put a seed of an idea into play. These goofy things were born! It’s the FOOTLONG MEASUREMENT STATION! I had a feeling that if I put some light string into the bottles and tied the ends that I would get a bottle that “shoots” the string out when it is squeezed. My little brain tied itself around this idea and it really worked! Tie many many many knots into the end of your string to keep “ketchup” or “mustard” from shooting out of the cap. Thread the end of a needle and drop other end of string into the cap and out the top of the nozzle. Tie many many many knots into the end of the string that is coming out of the top of the nozzle and fray the ends…for giggles mainly. Note: While I am a HUGE FAN of funky spellings, I simply cannot endorse spelling words that students need in testing and in other places incorrectly. That is why I went with “Customary Catsup” instead of “Kustomary Ketchup.” My kids need to see these words spelled correctly. Your students can use the Customary Catsup to practice their customary measurement and the Metric Mustard to practice their metric measurement. I also included a spot on the recording sheet to extend students thinking…mean, median and mode. I may just add range…again…for giggles. It’s great practice either way. I am always on the lookout for great concept stations that allow students to practice those skills and strategies that are taught at the very end of the year. In the math series my district uses, that means measurement and probability. However, our state tests are administered in November, so that means that these concepts usually test a bit low. MAP testing also has quite a bit of probability and measurement…again…if these concepts aren’t covered early on, it’s a bust. So I just thought that I’d put together an engaging (technical meaning: fun!) way for my third graders to practice their measurement skills. I’ve never been a big fan of giving a kid a ruler and then sending them out to measure arbitrary objects or practicing on drawings on a math worksheet…so this little station will fit the bill nicely. Noah came up with a ton of great game ideas that could be played after completing the center sheet that you’ll find here. My suggestion would be to run this sheet as a 2-sided paper or laminate one of these and use with a Vis-a-Vis marker or dry erase. As for Noah’s game ideas: why not try to have 2 students “duel” and see who comes closest to 6 inches? Noah also suggests have students try to come up with the shortest measurement squeeze or the longest. I’m sure there are plenty more where this came from. If you have any ideas, I’d love to hear them! Thanks for checking out my blog and this goofy goofy post! And remember…if you are taking the time to make one of these for yourself, why not take time to make a second for your teaching partner? (My new third grade partner, Megan, has no idea what’s coming her way!) And while you are at it…make a third for a wonderful teaching buddy…like the Wonderful Linda (my mentor and fourth grade partner! ).